Archbishop Charles Chaput delivered the following speech, termed an intervention, Oct. 7 in Rome at the Synod of Bishops on the Family. Pope Francis is leading selected bishops from around the world this month to discuss pastoral issues concerning marriage and family. The Instrumentum seemed to present us with two conflicting views: pastoral despair or a decision to hope. When Jesus experienced the pastoral despair of his Apostles, he reminded them that for man a thing may seem impossible, but for God all things are possible. In mastering nature for the purpose of human development, we human beings have wounded our oceans and the air we breathe. We’ve poisoned the human body with contraceptives. And we’ve scrambled the understanding of our own sexuality. In the name of individual fulfillment, we’ve busied ourselves with creating a new Babel of tyranny that feeds our desires but starves the soul. Paragraphs 7-10 of the Instrumentum did a good job of describing the condition of today’s families. But overall, the text engenders a subtle hopelessness. This leads to a spirit of compromise with certain sinful patterns of life and the reduction of Christian truths about marriage and sexuality to a set of beautiful ideals — which then leads to surrendering the redemptive mission of the Church. George Bernanos said that the virtue of hope is “despair, overcome.” We have no reason to despair. We have every reason to hope. Pope Francis saw this himself in Philadelphia. Nearly 900,000 people crowded the streets for the papal Mass that closed the World Meeting of Families. They were there because they love the Pope, but also because they believe in marriage. They believe in the family. And they were hungry to be fed by real food from the Vicar of Jesus Christ. We need to call people to perseverance in grace and to trust in the greatness God intended for them — not confirm them in their errors. Marriage embodies Christian hope – hope made flesh and sealed permanently in the love of a man and a woman. This synod needs to preach that truth more clearly with the radical passion of the Cross and Resurrection. You are right! Those proposing Holy Communion for the divorced-and-remarried are acting hopeless. Marriage until death as Jesus Christ preached it is possible and brings happiness. I know! I live it with my faithful husband and our 6 children. Amongst our friends and acquaintances we are the norm. There are many of us! It’s not some pie-in-the-sky dream. It’s a reality. We are succored by frequent confession (almost weekly – even the children) and holy Mass, reading the lives of the saints and celebrating their feasts and asking their intercession, prayer *every* day for each family member. It is possible and brings *peace. * Enthronement of the Sacred Heart image in our home and daily Rosary as well. God’s peace to His Bride, the Holy Catholic Church. Nothing happens without His holy will, for He is the Lord of History and of the Universe. Thank you, Bishop Chaput, for your prayerful ‘intervention.’ Our family will continue to pray and fast for the Synod. Thank you so much for your encouraging words for abandoned spouses who choose to live according to the Bible’s teachings. It meant so much to me!! Thank you! Archbishop Chaput’s short statement says it all in a few well chosen words. Half our battle in sustaining families and, restoring and uncovering the dignity of individuals is conveying the Truth in Jesus Christ and having an accurate understanding of the Cross He calls us to bare. The Cross is about accepting Truth which is often hard to carry in this world. Christ was free of sin, He was crucified, died and was buried, for sin and, rose again on the third day, in defeat of sin. So, there’s nothing in carrying or baring one’s Cross that has to do with baring or carrying one’s sin, gracefully. Thank you Archbishop Chaput, for speaking directly, about the Truth of the Family, in Jesus Christ and helping those who might be confused about this truth, to a better understanding of Christ teachings. Archbishop Chaput, we are so grateful to God for your fidelity to Our Lord and his Gospel and your willingness to preach the truth in love ‘in season and out of season.’ How much we as the faithful need to be reminded: the holiness of truth is possible to live!! And it is in perseverance that we win through ‘the race’. Our prayers are with you. TY for your courage and perseverance!! All God’s blessings and love. Thank you so much Excellency. You are certainly fulfilling your Apostolic mission in this. You are speaking for Jesus Christ. Keep it it up, and encourage your brother bishops to do the same. 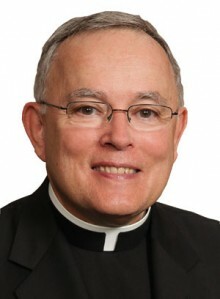 God Bless you Archbishop Chaput! God Bless you! You spoke the truth in charity, Archbishop…thank you so very much for this message of hope! I pray the Holy Spirit redirect the dissident bishops’ attempts to rewrite doctrines of the Church. At last, a Synod Father speaks up for those who, despite having been abandoned, often to bring up the children of a marriage alone, continue to live in fidelity to the teaching of Christ and his Church. Their circumstances often entail considerable material hardship, and is good to see such heroism acknowledged and praised, rather than dismissed as an impossible ideal. As a spouse leaning into the grace of sacramental marriage and striving to live out this reality with my four children, I too am grateful for this statement. Thank you, Archbishop, for this dignifying response. Thank you, Archbishop Chaput, for your strong statement. Hopefully there are enough other bishops who think as you do to prevent the severe wounding, if not destruction, of the Church Jesus founded. Thank you, Archbishop Chaput. I’m grateful to have a shepherd who encourages us in our efforts to embrace the Truth of Christ. thank you for the word “perseverance.” So needed in our world today. Your words are so insightful and spirit-filled! My heart and my yearning soul welcome this truth so beautifully presented – with love, compassion and honesty! Bravo, my dear Bishop – we are so blessed to have your leadership here in Pennsylvania. May our prayers support you through this whole synod “experience” – so vital to our future!! Happy Birthday for September 26th – you share a birthday with my son, Stephan, at the Seminary – and I know, through your kind and lively words, you are still very young at heart! Ad Multos Annos!! Thank you! I am heartbroken because (after 17 years) my daughter-in-law has left my son and is divorcing him. She is a different culture and no religion. They were married civilly in CA and at a nuptial mass in Phila. I am praying he can get an annulment in VT. So beautifully and CLEARLY put. Thank you and bless you. oh this needed to be said…I am ever so thankful….